Vladimir Putin seems to have found his historical role model: Tsar Alexander III. An anomalous facet of Russia’s authoritarian political system is that presidential elections are held on a regular basis. As Russian leader Vladimir Putin prepares for a ballot exercise in March, he has searched for a usable past that can help him legitimize his quasi-monarchical leadership style. In his quest for historical legitimation, Putin has skipped over Russia’s revolutionary and republican era and zeroed in on the late imperial period. It is there that he seems to have found a role model – Tsar Alexander III (r. 1881-1894). These days, modern-day Kremlin courtiers seem hell-bent on casting the Romanovs’ twilight years as a glorious period – a time when the empire was ruled by an assertive monarch who successfully managed to modernize a vast realm, while suppressing domestic dissent and keeping Western rivals at bay. 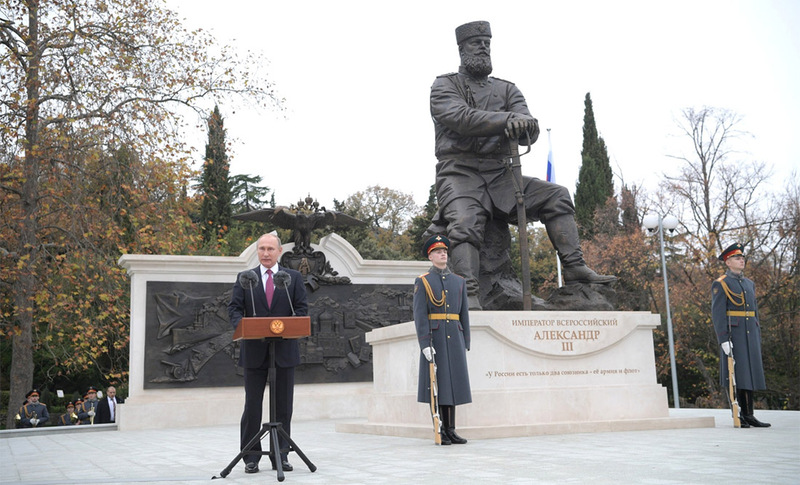 On November 18, shortly after the centennial of the 1917 Russian Revolution was all but ignored by the Kremlin, President Putin made a quick trip to Crimea – the Black Sea peninsula Russia annexed from Ukraine – to unveil the monument to Alexander III. The opening ceremony occurred at the picturesque seaside resort of Livadia, where the tsar’s bronze four-meter-tall seated statue was placed on the grounds of the former imperial palace – the beloved summer retreat of several generations of the Romanovs. Russian commentators were quick to note numerous similarities between the newest depiction of the famously nationalist Alexander III and an earlier monument to him created in the beginning of the 20th century by the Russo-Italian sculptor Pavel (Paolo) Trubetskoy. However, while Trubetskoy’s massive equestrian statue was a masterpiece that conveyed a sense of brute force to an extent that some members of the Romanov royal family believed the monument was a caricature of the late monarch, some observers characterize the Crimean bronze figure as banal glorification of a conservative-minded Russian autocrat, lacking in artistic value. The Crimea monument’s creator, Andrei Kovalchuk, said that he took his inspiration largely from a recent biography of Alexander III penned by the historian Aleksandr Myasnikov. The book, which came out in 2016 in a popular series “Life of Remarkable Individuals” is a hagiographic account of the “Tsar-Peacemaker’s” 13-year reign. It is noteworthy that a foreword to the volume was written by Bishop Tikhon (Shevkunov), a Russian church leader who is rumored to have Putin’s ear, and who reputedly exerts considerable influence in top-level internal debates on how to define Russia’s official symbolic politics. Some commentators have argued that Putin’s affinity for Alexander III is a relatively recent phenomenon – a move aimed to further strengthen the ideological foundations of Russia’s assertive international conduct and conservative domestic politics following Ukraine’s Euromaidan revolution, an event that greatly widened Russia’s rift with the West. In the sphere of Russian popular culture, the reign of Alexander III started coming into vogue also in the late 1990s with the release of Nikita Mikhalkov’s 1998 film The Barber of Siberia, in which the Kremlin-connected and national-minded director played the bear-like Russian autocrat. The idea to commemorate Alexander III in Crimea appears to signify a symbolic victory of one Kremlin faction over the other. Until very recently the favored artistic project seemed to be the one promoted by Russian Minister of Culture and chairman of Russian Historical-Military Society Vladimir Medinsky, who was pushing for the erection, also in Crimea, of a “Monument of Reconciliation.” The latter was meant to symbolize the “spiritual healing” of Russian society that has finally managed to overcome deep divisions created by the Civil War between the Reds and the Whites.